Supreme Windows are a family run business and have been installing UPVc Windows, Doors, Conservatories and Roofline products for over 30 years in Bury, Bolton, Warrington, Manchester, Stockport, Chester, North Wales and surrounding North West areas. Whether its your whole house we are replacing or just replacement glass units, every single installation is done with complete care & pride, that is why 80% of our work is via customer recommendations. Please check out our testimonial page and see what over 100 real customers have to say about us! Windows - All come with high security shoot & bolt locking & are internally glazed for maximum security. No nasty thick black gasket around the frame, our frames come with a low sight-line gasket, but still provides a full seal around the glass that has been designed to prevent draughts & leaks. Glass - Our low emissivity glass together with argon gas filled units can greatly improve the insulation of windows & help lower heating costs. Doors - Make your front entrance a beautiful entrance with our many choices of door panels to choose from. Our doors have a whole host of security features such as a 7 point locking system comprising of tempered steel hooks, roller cams & dead bolts, all door frames are fully reinforced with galvanised steel and our panels are reinforced as standard. Conservatories - Everybody wants a conservatory for different reasons, which is why we will take the time & sit with you & design your perfect conservatory. 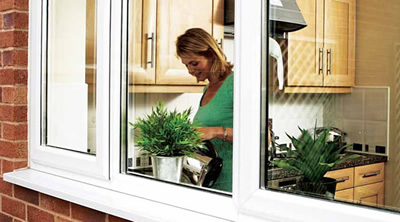 Every conservatory is built to your specific order & requirements. We will also advise on planning & building regulations where required as well as heating & ventilation. Once the conservatory is complete, all you will have to do is relax and enjoy the view! Facia, Soffits & Guttering - Some companies just cover over the fascia's but at Supreme Windows we completely replace it with new, only using the highest quality UPVC, ensuring a maintenance free roofline for many years to come.